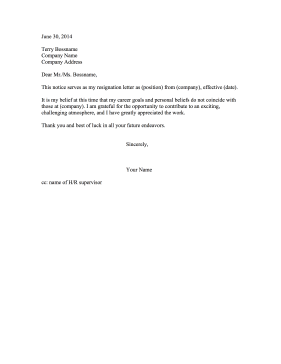 Make a statement about ethical conduct in the workplace with this resignation letter over company morals. This notice serves as my resignation letter as (position) from (company), effective (date). It is my belief at this time that my career goals and personal beliefs do not coincide with those at (company). I am grateful for the opportunity to contribute to an exciting, challenging atmosphere, and I have greatly appreciated the work. Thank you and best of luck in all your future endeavors.